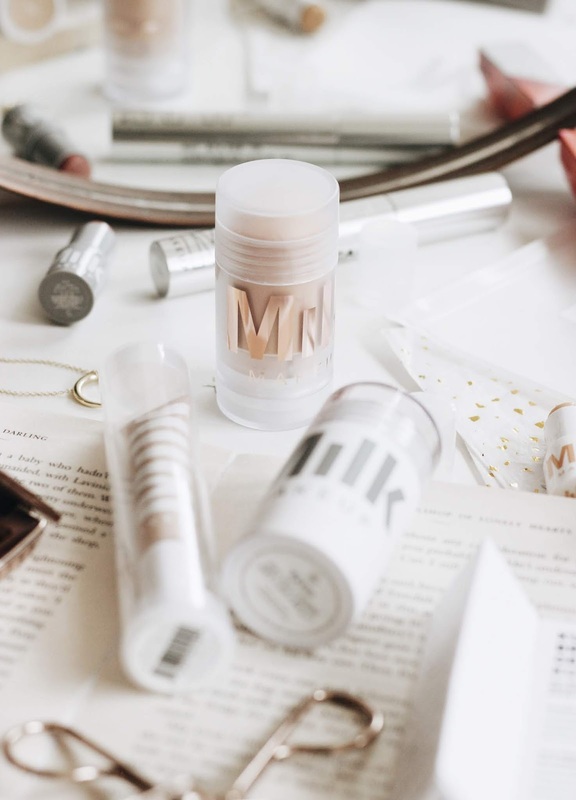 One of my favourite bloggers From Roses inspired this blog post after seeing her recent line up of her favourite skincare brands, so I thought I would do a high end makeup brand round up. This was a lot harder than I imagined as I have so many makeup favourites, but I ended up narrowing it down to the amount of products I use from them and have in my collection. First up is Charlotte Tilbury, a brand known for their dreamy rose casting and high quality formulas. Their Filmstar Bronze and Glow was one of the first products I ever used by them and I'd still recommend this duo many years on, but they have upped their game in terms of lipsticks and eyeshadow formulas too as well as their Highlighting Wand which is one my all time favourites. I remember when Too Faced was available in Boots many moons ago, but it stopped being sold there for ages until it's growth in popularity a few years back now. We waited patiently for the new releases to trickle down to the UK and now I've tried a fair few products of theirs. The Hangover Primer was one of the first first product I use and I was smitten as it created a hydrated base where foundation was sit perfectly on top of. 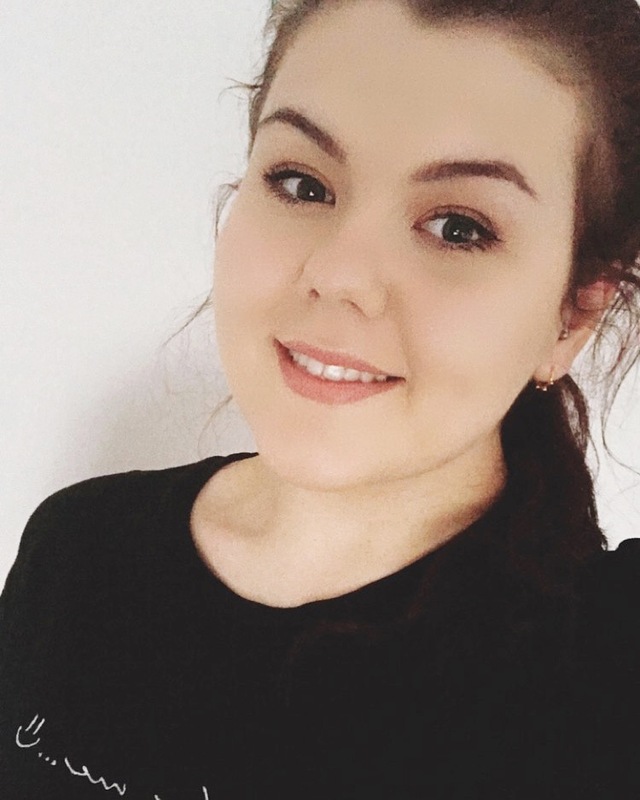 This was my favourite product of theirs until I tried the Born This Way Foundation which I purchased when in Sephora in Paris a couple of Summers ago and it was my go-to for a while as it's medium coverage formula and natural finish is everything I look for. 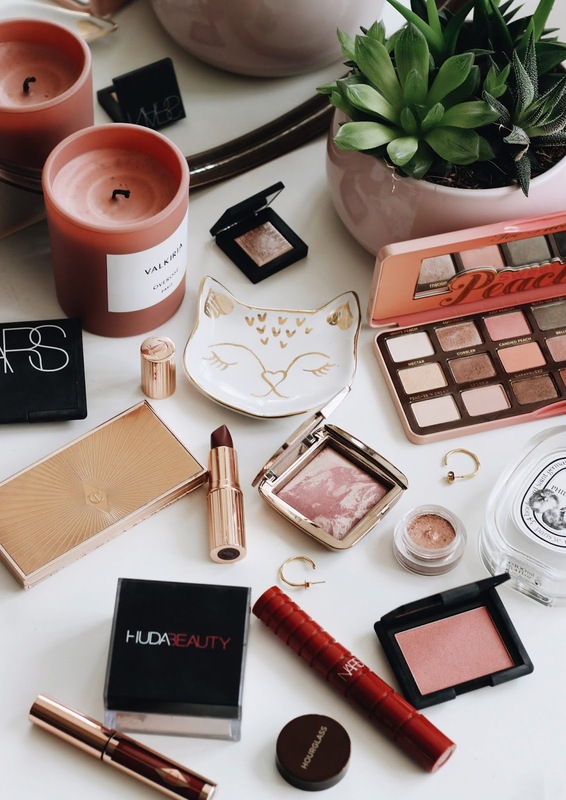 Huda Beauty is the newest brand out the bunch in this round up to me, so this was an unexpected favourite of mine when I was putting this together, but because I use so many of their products of theirs on a daily basis. The Overachiever Concealer and Easy Bake Loose Powder is a duo that I adore when I want to brighten up my under-eye area and keep it looking creaseless all day long. When I think of luxe makeup brands, Hourglass always springs to mind as their packaging is always on point and the majority of products from them that I've tried have impressed me. The Hourglass Palette's and blushers are what I'd recommend to anybody if they're looking to dabble in the brand, but of course it's important to mention that they're not particularly affordable - so definitely a treat! Out of all the brands in this line up, Nars is the one that I've tried the most from, so of course that means there's going to be products from them that I'm not fond of, but there's still lots that I adore. Starting with the Nars Laguna Bronzer* which I have been using every day at the moment, this perfectly warm toned hue sculpts the face without leaving it with any dull, grey undertone like other bronzers can do. The Nars Radiance Primer was a product that I picked up a couple of years back, but I've been meaning to repurchase since as it was a great way to perk up the complexion and add a glow to the skin. As this post was hard to narrow down to just five, I had to have a section dedicated to some honourable mentions. I didn't know if Pixi would be considered high end, but their makeup always impresses me, although I'd say opt for their skincare first because it's amazing. Another one is Anastasia Beverly Hills which is a brand I've never had a product I've been disappointed in. The Amrezy Highlighting Powder* is one of my all-time favourites and I would recommend it to anybody looking for a champagne hued highlighter that will last long on your cheekbones and make them pop. 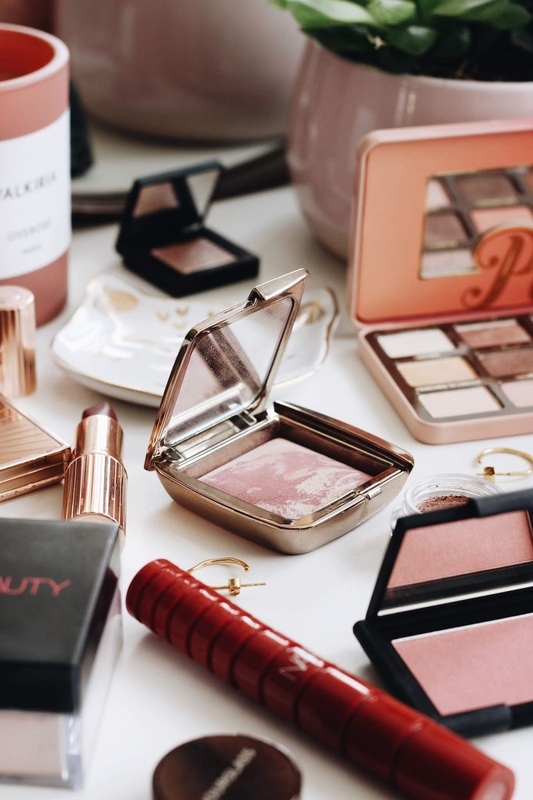 Of course, their Soft Glam Eye Shadow Palette*, although expensive at £43, has to get a mention as it's one of my most reached for palettes ever. Urban Decay is another one I contemplated putting in the top five, but decided not to as aside from their mascara and eye shadow palettes, I've not tried much else from the rest of their ranges. Saying that, their All Nighter Setting Spray* is probably my top product from them as it's incredible for increasing longevity of your makeup and fixing any mishaps you have when getting too heavy with the setting powder. What are your favourite high end makeup brands? With the sudden spate of warm weather and the promise that it's around to stay, I've had a slight panic that I haven't got enough Spring and Summer appropriate wear in my wardrobe. I started to make a wishlist for our holiday to Portugal which is later this month and after the success of my other posts similar to this, I thought I'd share it with you today. I've not been very inspired when it comes to Spring outfits as I've not been sure if I need to wear a more than one layer or if I need to put my sunglasses on my head, but after picking up this Boohoo Polka Dot Lemon Playsuit I'm starting to feel like I'm getting in the swing of it again. I'm on the look out for the perfect white dress and this NA-KD Wrap Front Dress is on my list as the whole of NA-KD's dresses look super pretty and chic. Another one on my wishlist is the ASOS Puff Sleeved Dress which is in my favourite broderie style which always makes for a dreamy Summery addition. Imagine these paired with this ASOS Raffia Headband and these Strap Weave Sliders (which I think is going to be a trend this season). Last year, a basket bag was top of my wishlist, but by the time I decided I wanted one at the start of Summer, it was too late and everywhere had sold out. This year, I got in their first picking up this South Beach Round Straw Bag and I've now added a few more to my wishlist in the meantime. I know how expensive the wicker, bamboo and straw bags can get, so I thought I'd put together an ultimate list of my top picks all under £50 - some of which are absolute steals! The round bags are usually the most popular, so it's handy to get in their first. Mango are great for handbags in general and although they're on the higher end of the scale, they're beautiful nevertheless. This one in particular looks lovely in my opinion, but they even do them in different shapes like a tortoise one (more expensive than £50 though, but I did have to give it a quick mention). Topshop is another place that I love checking in one as some of my most long lasting bags have been from them. The Saffi Wicker Grab Bag is definitely one that I think a few people would like the look of and the sturdiness of the material means that it can carry your belongings with no problem. The Skyla Straw alternative is a little different and the tortoiseshell handle makes it a little different to the rest of my top picks. Of course it goes without saying that ASOS may still be one of my favourite places to browse and they have so many gems in right now when it comes to these sorts of bags. This Glamorous Boxy offering would be great for anybody looking for something a little bit more understated and the white detailing means that it'll add a Summer spin to any outfit. Similarly, another understated pick and one that I'm very tempted to pick up next is the Liars and Liars Black Cross Body Bag which structured exterior and gold hardware really draws me in. I think it's important to find one with the right shape, size and type of handle that you like. If you want something to stand out a little bit more then this My Accessories Half Moon Bag which is also similar to ASOS' own one are two great ones to check out. Do you like the basket, bamboo and straw bags I've picked out? Let me know your favourites! I've done a similar post to this last year here, but I wanted to update it a little as there's a few new products I enjoy using a lot more regularly and I wanted to share some of my favourites too. Although I head to blogs for full in-depth reviews, Instagram tends to be the place that I first spot a new-in product and go on to want to know more about it. 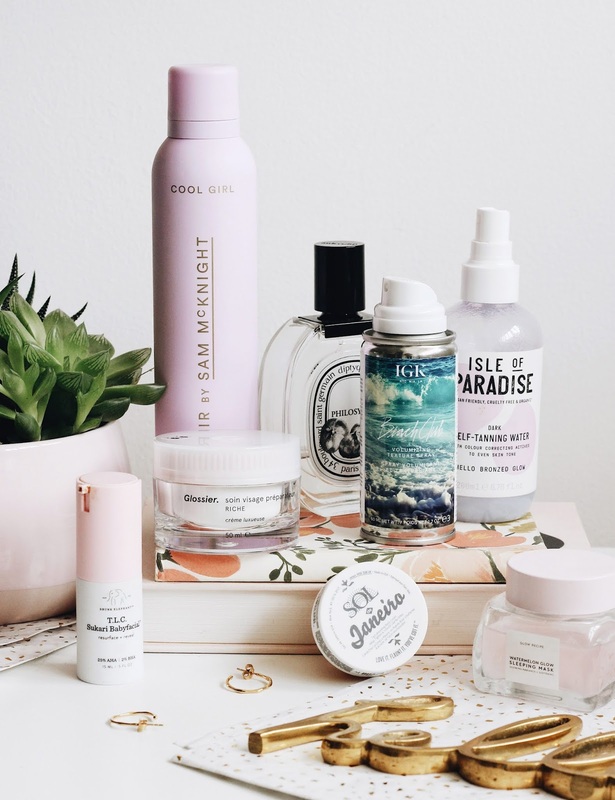 Here are eight body care, hair care and skincare items that have been influenced by Instagram. As you've probably noticed from the main photograph, there's a common theme in the packaging of the products in this post and that's millennial pink. The Sam McKnight Cool Girl Texture Mist is the perfect example of this. This helps to tame my flyaways hairs after I've washed my locks and creates tousled effect when I've curled my hair too. I've tried a few products from IGK and they always leave me wanting more. I'm not sure if it's because of their cute packaging and the fact they do handy miniatures which allow you to try out the product before you buy the full sized version. The Beach Club Spray is helps to add volume to the roots without feeling crunchy or heavy. It was a toss up between the Bondi Sands Liquid Gold and the Isle of Paradise Tanning Water when I was thinking about the fake tan that sticks out in my mind the most. They're actually quite similar in terms of the way they apply and sit on the skin, but I think the IOP offering just slightly gets the top spot due to the longevity and scent. Moving on to body moisturiser now and it's the Sol De Janeiro Bum Bum Cream that I'm talking now as it was once all over Instagram. I won't ramble too much, but I can totally see how it lives up to the hype. The scent is delightful, it sinks in quickly and leaves the skin feeling (and looking!) great. I've actually got plans to do a makeup version of this post, so I wasn't sure where to put Glossier as it's one of the first brands I think of whenever I think of Instagram. Other than their Solution, all of their skincare products have impressed me especially the Milky Oil, Priming Moisturiser Rich and Mega Green Galaxy Pack Mask Duo which I just couldn't pick between when selecting one favourite product for this line up. Another skincare brand Instagram introduced me to is Drunk Elephant and at this point, it was a brand that wasn't available in the UK, so I got my first product, the Baby Facial from a seller on Depop. This one still isn't available over here, but still remains my favourite product from them as it instantly uplifts my complexion, making it look clearer and smoother over night. Last up in terms of skincare is the Glow Recipe Watermelon Mask which I've spoken about a lot, so I won't go on about it too much longer. I chose this one for this line up over the Fresh Rose Face Mask* because I've seen it a lot more of beauty bloggers Insta's, so I went with this one instead. My skin continues to enjoy every application, making my complexion look brighter and feel softer. 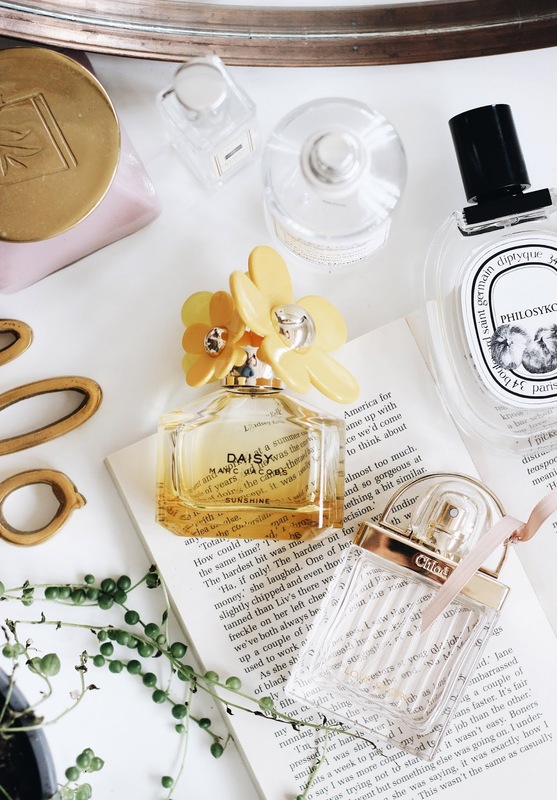 Although I've got a few fair perfume favourites, they usually come about from other people's blog recommendations or having a sniff of them in person. That being said, Instagram definitely introduced me to Diptyque as a brand and thus made me try out the Philosykos EDP which I probably wouldn't have been that drawn to before. Have you ever been influenced by Instagram when making a purchase? I'm embracing the longer evenings and the promises of warmer weather now that Spring is here. Alongside putting away my jumpers for the time being, I've started to switch up my perfumes too, opting for fresher, lighter scents to replace my warmer, deeper notes that I wear in the Winter. First up is a fragrance that whenever I spray it, I feel like I'm strolling through a florist or a field full of blossoming flowers. Of course the only perfume I can be talking about is the Maison Margiela Flower Market* which I'm currently on the last dregs of, but I've loved each and every spray that I've used. It's fresh, long lasting and perks my day up whenever I wear it. One that's similar in the way it sits on the skin is the Marc Jacobs Daisy Sunshine* which is just as uplifting and if you're a fan of their original scent, then this has a great twist to it with extra notes of white strawberry and marigolds. 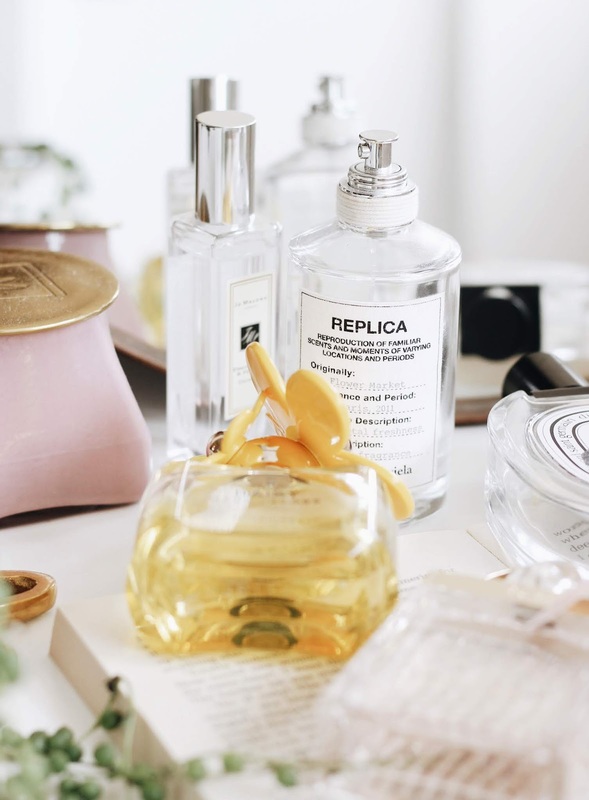 It's got a distinctive floral fragrance like the Maison Margiela offering, but it can be worn on it's own or mixed with another perfume, to create a unique scent each time you wear it. Although described as the essence of Autumn, I actually think the Jo Malone English Pear and Freesia is rather fitting for the warmer weather in my eyes. It's got notes from each of my favourite perfumes types including citrus, fruity and floral, making it one that I reach for on special occasions. With notes of sharp fig and woody cedar, the Diptyque Philosykos hits the nail on the head when it describes this offering as an evocative scent of Summer. It's one that has uplifted me throughout the colder months and I'm ready to spritz it more now Spring is upon us. I'm a fan of the original Chloé perfume, but after using it up the Love Story EDP* is currently the one I reach for. It's great for everyday wear as it's quite lightweight however it still lingers on the skin all day. With a combination of orange blossom and jasmine, it's perfect for Spring, whilst not being too overpowering - perfect for those who like a subtle perfume. What are your favourite perfumes for Spring? 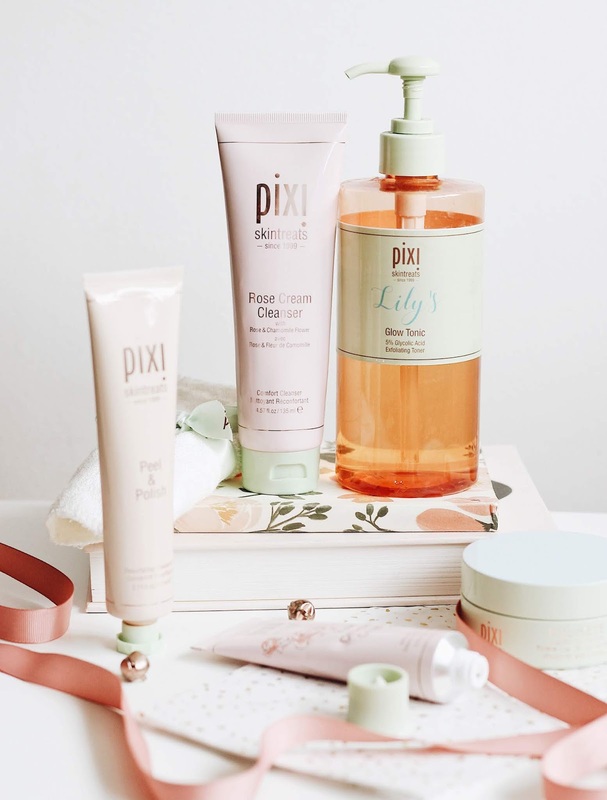 Pixi has some of my favourite skincare products, but with the lots of new ranges being released it can be a little overwhelming if you're new to the brand. Before their new glow tonic, vitamin c and hydrating collections came out, I had tried out my fair share of products from them, so I feel like narrowing down my five must-haves from Pixi to you. If you're looking to invest then I'd recommend you read on. First up has to be Pixi's most famous product and that's Glow Tonic*. It's a chemical exfoliator enriched with glycolic acid to promote a brighter complexion with the aloe and witch hazel ingredients helping to soothe the skin and decrease any blemishes you may have. It's one that I've been using for years now and I always come back to it as my skin really enjoys it especially when it's feeling a little on the dry side. I've got to give a quick mention to the GLOW Sheet Mask* which is in the same family as Glow Tonic and after just three uses, I'm absolutely smitten and it seriously brightens my complexion in an instant. If you're wanting a physical exfoliator then I'd recommend opting for Peel and Polish*, a face scrub that gets to work to rid the skin of dry patches, leaving the skin looking brighter and feeling softer. I've used several tubes of this already and if I had to choose, this would be my favourite product from them (eeek! it's hard to pick!). I've got both the Hydrating Milky Cleanser and Glow Tonic Cleansing Gel on my wishlist after the success of the Rose Cream Cleanser*. This offering has taken over my love for the Caroline Hirons Cleansing Oil Duo* just a little bit as I like that it's in a easy squeeze tube instead and I feel like the product is never ending considering how much I use it. Despite the cream formula, which can sometimes leave a film on my skin, this one makes my complexion not only feel a lot cleaner, it removes my makeup very well and makes it feel smooth too. It's nothing too fancy and if you're looking for something that's going to blow your socks off maybe this isn't for you, but for when my skin is feeling on the sensitive side and I just need the job done this is perfect. Another simple pick is the Rose Ceramide Cream* (can you see the trend here?). Their rose range in general is delightfully scented and my skin loves when I used it too, so I was happy that it also reacted well to this moisturiser. It's quite thick but it sinks in quickly and leaves my complexion not only feeling at all sticky. It's a good allrounder that soothes as well as nourishes and never has broke me out, something a lot of thicker formulas tend to do if I'm not careful. The newest addition to this line up and up until the other week, it wasn't even going to be included in this post, but after using them multiple times I have to give them a mention. The DetoxifEYE Eye Patches* instantly makes a difference to the eye area by refreshing and hydrating. These have already saved me recently as hayfever is playing havoc with my skin and these help to soothe in ten minutes. You can 30 pairs in the tub, which I think is great and I'm sure that they'll come in handy over the next season too. What are your favourite Pixi skincare products? The clocks have gone forward, I've seen the most magical cherry blossom trees and I think it's safe to say that Spring has officially sprung. March saw a quick trip to the Cotswolds and Bath accompanied by the glorious weather and even better food, but April has high promises too. I've put together a list consisting of five things I've added to this month's to-do list and I wanted to share them with you today. Do A Lush Order | I haven't shopped in Lush since Christmas, but their new releases are seriously tempting right now. The Rose Bombshell Egg and Golden Egg are of course on the list, but their Spring collection has made its way onto my wishlist too. Add More Greenery To The Home | There's something about the warmer, brighter weather that makes my want to fill each room with blossoming flowers and falling plants. I've got my eye on a few hanging planters to put them in as well as homeware pieces to compliments the green too - I'm thinking lots of brass and gold accents. Have A Clear Out | In March, we emptied our spare bedroom and cleared out of wardrobes, switching around where my desk sits and getting some more storage too. The only element of the room I didn't completely sort out was my beauty cabinet, so that's on my to-do list for this month. It's a huge task, but one that will feel much better when done. Plan Our Trip To Portugal | We were supposed to go away for a few days at the end of March, but a few events meant that we no longer couldn't go, so we swapped it for a night away in the Cotswolds as I previously mentioned. It ended up being a blessing in disguise, so we took it upon ourselves to secure a few days in Porto at the end of April instead. I want to get researching some places to visit whilst we're there and make sure I'm ready for the hot weather we'll hopefully be experiencing. Find New Recipes To Try | With each new season, I like to incorporate new fruits and veggies into my diet. I've started to have a smoothie a few times a week packed full of all the good greens, but I want to dig out my favourite salad and lighter meal recipes too. What's on your April to-do list?